For most of my life, when I heard the word “labyrinth,” I would think of Jim Henson’s 1986 film that, frankly, used to scare the bejeezers out of me. You probably remember it: that twisting, turning, dangerous obstacle course that surrounded and protected the Goblin City (where David Bowe sat with the “babe.”). For whatever the reason, I always think of poor Sarah as she circles and circles the brick-lined path (which looks surprisingly like Indiana…) until, frustrated, she throws herself to the ground and meets a blue-haired worm. “There’s no turns,” she laments, “there’s no turns or openings!” The worm is confused. To him, it’s obvious: the openings are everywhere; she just isn’t looking right. “Things aren’t always what they seem in this place,” the worm tells her. 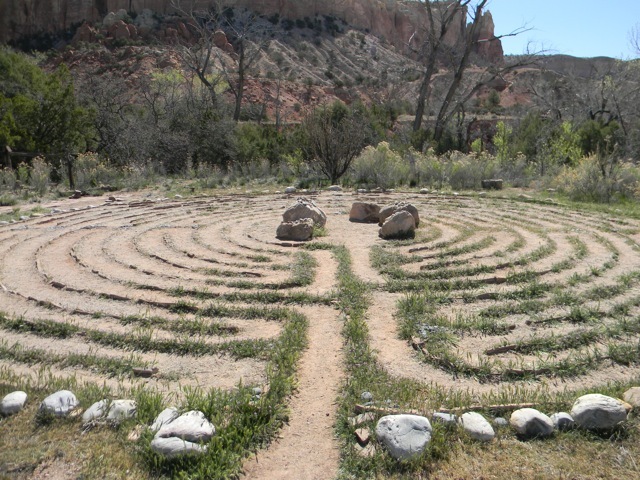 Unlike Jim Henson’s Labyrinth, which twists and turns like a maze, the spiritual labyrinth represents a single path and is often used as a tool for meditation. In these labyrinths, you cannot get lost. You walk the path, follow its curves, pause in the center, and then journey back outward. As artist Sandra Wasco-Flood, founder of Living Labyrinths for Peace, explains, when you walk a labyrinth, you embark on “an inward journey, and you come back into the world reborn.” I know, I know, so maybe this sounds like some hippie-talk to you, but try one out. I think you’ll get it. Interestingly, labyrinths are also helpful in lowering blood pressure, solving conflict, and even assisting those with dyslexia and autism. This year, I set a goal to finish my book by the end of March. I quit my second job, and am and we are eeking by. We are broke, but I am writing, and while this is an amazing gift of time, it is also terrifying. Rather than having a dissertation deadline to push the novel though, I have only myself and the knowledge that if I don’t use this time wisely, I will have brought on our current financial crisis for nothing. And so, in order to ward off anxiety, I’ve become a frequenter of labyrinths. Whenever I feel particularly cluttered or frustrated or stuck, I drive the three miles across town to walk what seems to be a forgotten path. Its been very cold here in Indiana. Often the path is covered in snow. Once, the snow had melted and the labyrinth was a giant puddle which I had to slog through. Only once was the sun out and the day warm enough to walk without a hood. When I’m doubting my work, the labyrinth calms me. It helps me sort through my book. It reminds me (cue the cliches) that writing really is a journey, and I am on a path. I might twist and turn. I might stop and stare at the sky. I might have no idea where in the journey I am. But I do know this: if I keep walking, I’ll get there eventually. And so will my book. Friends, we’re a fourth of the way through. The work of our tasks are setting in. The center is right around the corner. Keep going. There is much joy in the simple act of walking. ← Shameless Plug? or Inspiration? I love the Labyrinth in the NE Heights! You should check it out! Wow. I haven’t been to the A.R.E. in Virginia Beach in the longest time! They installed a labyrinth there in 2006 and I never knew. It’s just a few miles from where I live. From the picture I see that it is outside and made of cement. I’ll have to get there before tourist season and check it out! Thanks for your post.